Kidz Bikez, Chain Ring Art, and Volunteering!!!!! 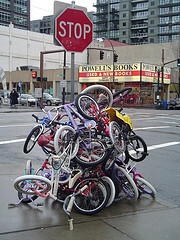 Some bike artists in Tuscon ,AZ want a lot of chain rings for who knows what reason. If you have some gnarled teeth (or any busted parts/tires/etc.) bring um' down so we can free up space in the landfills. The bike cooperative is run by volunteers and we want more people to help one-on-one with visitors, strip down bikes, build bikes, and other various tasks of running a community bike shop. If saving defenseless bicycles from the mounds of post-consumerist waste, transforming "trash" into usable bikes/art/anything, and spreading bicycle wizard knowledge sounds interesting then you should click on the volunteer tab…or not. Previous Post MORE PARTS AND BIKES!!!!!!!!!!!!!!!!!!! Next Post Critical Mass Bicycle Ride!!! !